This was June...realising that I have spent most of this month wearing my hair straight. This does make sense as during the wetter months there isn't any point in straightening it. There's really no point if there's even a drop of moisture in the air, because it just frizzes up. I can still feel the winds of change blowing! 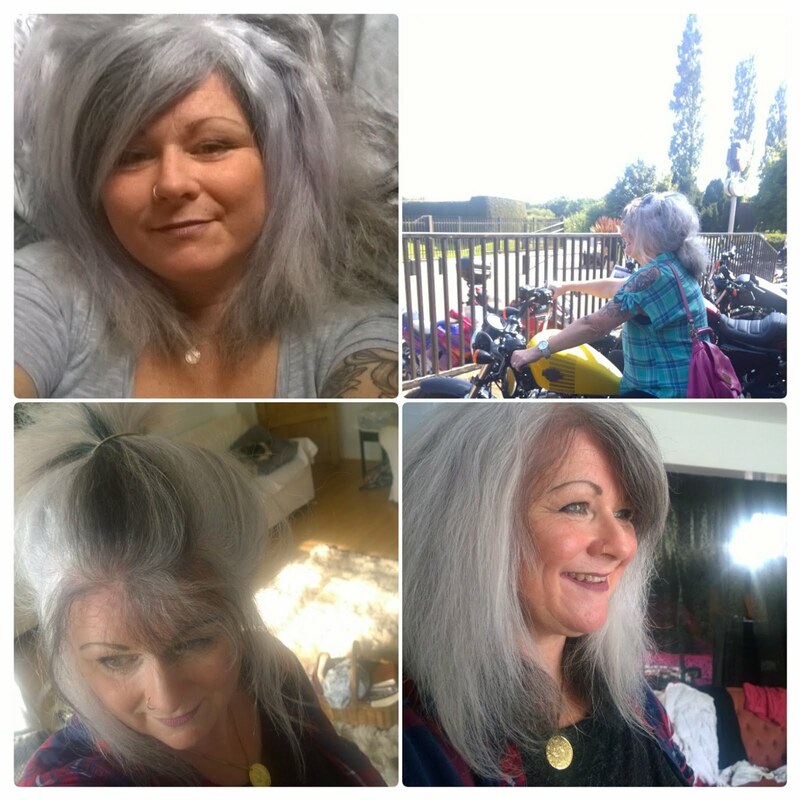 Yep, I do love this steely silver grey but it sometimes looks really harsh against my skin, and I think it can look a bit sombre and aging. If I'm in full makeup, and dressed up its fine, but day-to-day I'm starting to feel that it doesn't represent what's going on inside me! Changing this up could be really tricky. 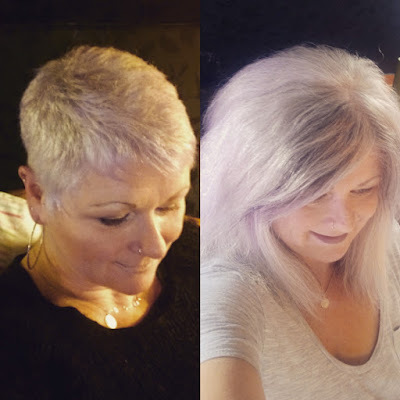 I've been using a gorgeous steely grey colour by Metallic Colours to eradicate some light brown at the back, underneath where my hair is still dark. The brown was left over from when I last bleached in October 2016, gosh it's been 8 months! Anyway, I had some of the grey mixture left, and I got tempted and a little dye-happy, and I added/enhanced a darker area in the front, which you can see clearly in the bottom left picture. I think it looks fine in that picture, but in practice it's looking a bit harsh, in my opinion. Early speculation is that I may be trying some Colour B4, before dumping a shed load of bleach on the top and going blonde for the summer. I'd like to think that I could just do that but I'm really nervous about messing it up...there's no going back to this white if I don't like it...just more agonising months/years of growing it out...and I've just come through 18 months of that...pop your email address in the sub box if you're even remotely interested in seeing what I do next! Let me know what you think in the comments below...also, are you growing out your pixie, or thinking about it? Do share your thoughts!